White House: No Comment On Ailing John McCain - Joe.My.God. It got off to a bad start, and President Trump’s venomous relationship with Sen. John McCain probably won’t end well either. 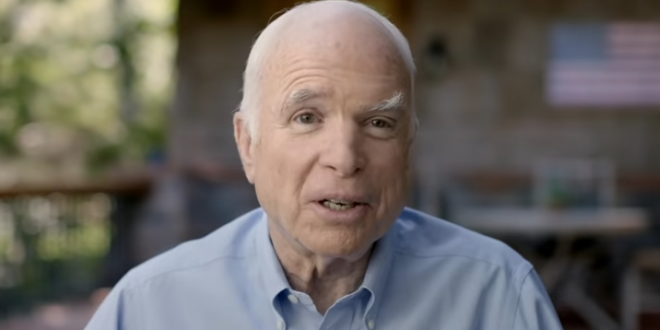 The president was reportedly disinvited to McCain’s funeral months ago, after McCain’s battle with brain cancer took a turn for the worse, and now the veteran Arizona Republican senator has decided to discontinue medical treatment. Rememeber when John McCain spent 5.5 years in a POW camp and Trump said “I like people who weren’t captured”? If Donald Trump was any kind of a decent man, he would apologize to John McCain for that comment before it’s too late. I still don’t understand how Trump’s “I like people who weren’t captured” about John McCain comment didn’t end his presidential campaign in its infancy. Trump has never made a public apology for his terrible comments about Senator John McCain. A more decent and honorable person would have apologized long ago.